To me, this card defines background noise. I say that because for years, I never noticed what was going on with this card. Sure, I'm a Padres fan and I've probably seen this card oodles of times. 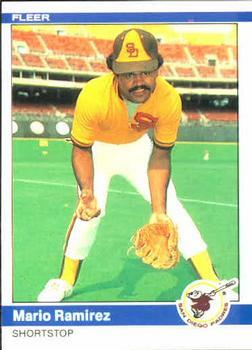 However, let's be honest, it's Mario Ramirez who was a career .192 hitter and was the perennial backup to Garry Templeton. Not exactly a card that likely garnered much attention. If anything people are probably drawn to Mario's askew cap, peeking 'fro/perm and thick, bushy mustache. He almost reminds me of a Sesame Street character. Of course, that could be the all the yellow and the fact that he's big. I mean literally, he's huge. Check out the picture. Why does he look so huge? Well, look to his right, and you'll see a player in the outfield that appears to be the size of an ant. Could it be the angle? No way. And then, check out the outfield wall distance marker that is magically appearing on the AstroTurf in left field. What the??? Ok, something weird is going on in this card. There is obviously some double exposure going on, or the folks at Fleer were having some fun... Oh, and to top off the Background Noise, I'm digging the shadow behind/below Mario, as well as the bright, nuclear yellow sky above the outfield bleachers. Shenanigans indeed I think.